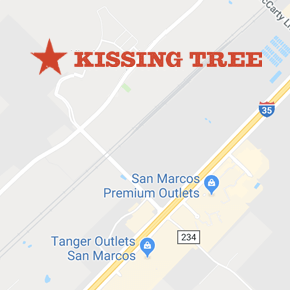 Kissing Tree is a distinctly Texan community built for those 55 and better. Set on the banks of the Hill Country, the planned 3,200-home community is conveniently located between Austin and San Antonio in the charming town of San Marcos. Custom-built with a Texas attitude, the unique collection of indoor and outdoor amenities was designed with legendary living in mind and every home is built to match its homesite, making the most of its Hill Country location and view. Here’s to living life on your own terms. Kissing Tree is the first baby boomer-centric gated community designed specifically for the spirit of Texas. The lifestyle, homes and amenities are geared toward the active adult lifestyle of those 55 and better. Kissing Tree’s 20-acre amenity campus, The Mix, includes an 18-hole golf course, eight pickleball courts, six bocce ball courts, putting greens, a social building with an indoor and outdoor bar, hiking trails and more! To learn more about active adult communities, see our FAQs. Brookfield Residential has been developing thoughtful master-planned communities and building homes of distinction throughout North America since 1958. Brookfield creates the best places to call home through combined experience, passion for the business and unique product. Based in Calgary, the headquarters operates with the same strong values as we do here in Central Texas – passion, integrity and community.